Newly released satellite imagery shows that Cambodian forests were cleared in 2016 at a rate 30 percent higher than in 2015 – despite Military Police forming a special task force to undertake a yearlong crackdown on illegal logging that same year. The new data, released by the University of Maryland, tracks forest cover loss globally using satellite imagery. Results showed that not only was 2016 worse than 2015, but of the 16 years for which deforestation was recorded, last year was the fourth worst – with around 200,000 hectares lost. The imagery also puts into view the rampant logging that has occurred in the country’s northeast, which has been a conduit for illegal exports of timber to Vietnam. 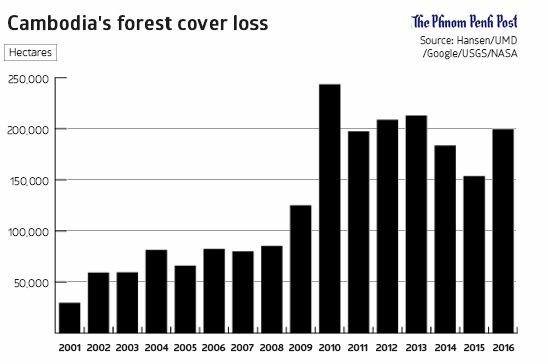 The uptick in forest loss over both 2014 and 2015 levels coincides with the formation of a committee to quell illegal logging and illegal timber exports to Vietnam, headed by National Military Police Commander Sao Sokha. Throughout last year, Prime Minister Hun Sen and Environment Minister Say Samal assured the nation that the rapid decline of Cambodia’s forests had stopped, despite numerous reports to the contrary. For instance, a recent investigation by the Environmental Investigation Agency, released this May, found evidence of coordinated logging operations in Ratanakkiri province in which Cambodian and Vietnamese officials were paid off to clear the way for approximately 100 timber trucks to cross the border each day in December and January. Marcus Hardtke, a long-time anti-logging activist, said the new data showed that Virachey National Park was still suffering logging problems and that deforestation was encroaching on the Prey Lang Wildlife Sanctuary from both the north and south. He said multiple statements and pledges of action against forest crimes had been made over the years – dating as far back as the UNTAC period in the early 1990s – but that nothing had happened. “What we are seeing is not surprising, and the increases are present in hotspots, including the protected areas,” he said. Reached yesterday, Environment Minister Say Samal questioned the new findings, saying they didn’t match with his official data, but he did not provide details of those statistics. Anti-logging task force spokesman Eng Hy declined to answer questions on the new findings before hanging up the phone. “I am not a forest monitor, but a forest crime crackdown [official],” he said. Keo Omalis, spokesman for the Agriculture Ministry’s Forestry Administration, said he had not seen the report, but again claimed that deforestation was declining. “Between 2010 and 2014 we lost a lot of forest because we granted ELCs [economic land concessions] for planting rubber trees, but later on, the loss of forest decreases,” he said. This entry was posted in environment, Forest, Forest, Land, Phnom Penh Post, Protect national resources, protect natural resources and tagged Cambodia, environment, Forest, Land, Phnom Penh Post, protect natural resources, Timber. Bookmark the permalink.